One tool that many chambers do not use to its fullest potential is a website. 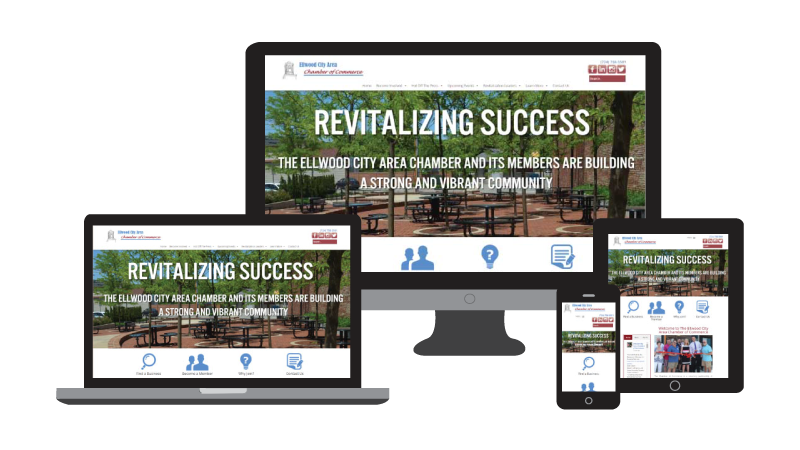 A properly developed chamber of commerce web design can deliver important benefits to both existing and potential chamber members as well as members of the community. A fully responsive website meaning that it is optimized for phones and tablets. The website will provide a great user experience regardless of the device being used to access the website. A website that is easily updatable by the municipality staff. We provide training and develop the website in a platform that is very user friendly. If you can use Microsoft Word, then you can update your own website content and photos. An extremely affordable price. Our websites are affordable and there are no ongoing-fees. We also offer payment plans to stretch out the cost of the website. A website that does not require software upgrades. Our websites are designed in WordPress, which is open-architecture and does not require the purchase of software. Increased staff efficiency: A website loaded with useful information such as contact information, directions, applications, forms and meeting agendas can significantly reduce the number of time consuming phone calls and in-person requests received. Improved member and community satisfaction: A great website can reduce the need for members to wait on hold or stand at a counter to get the service and information they need. Furthermore, chambers with effective websites differentiate themselves from chambers with no websites or older websites. A good chamber of commerce website can help attract new members. Enhanced chamber initiatives: Websites can be used to enhance an initiative. Want to promote or expand a program? Post information on the website outlining the details and instructions. Want to receive feedback from members or the community? Put a form or questionnaire online and ask for feedback. The ability to promote events for free: A website with current content can be a great tool for chamber members and the community to know about upcoming events such as parades, meetings, fundraisers, and festivals. Unlike other forms of advertising, websites and social media are free. The capability to promote members: Utilize a website to promote your chamber members with business profiles, featured members, announcements and more. Local support. Our team is 100% local. From a structure standpoint, user experience and the flow of information is extremely important. It is important to design the site so that pages contain useful information that can be found easily and is not overwhelming. Utilizing mega menus and drop down menus to give visitors options will improve the user experience. Pages with easily updateable content, including the ability for the staff to directly add additional pages. This allows for important or time sensitive information to be added quickly and without hassle. Membership Directory is sorted alphabetically by default and can also be sorted by industry. Listings are shown at the top of the Member Directory. A customized, dedicated page on the chamber of commerce website with in-depth info, social media links, and images. The company logo is featured on each page of the website with a link to the company website. Calendars for chamber events, community events, meetings, grand openings, etc. Contact information and Board Member Info. Integration of social media links. A live feed of all Facebook or Twitter posts by the Chamber can featured on the Home page. News and event information for the Chamber and Community. Designed to work on any size device and be attractive and easy to use on each. Direct dial phone number links on mobile devices.